Let’s face it, we all need to work out. I’s just the way it is. There are some days when I hate every minute of it, but I feel so happy afterwards. And yes, you get hot,sweaty, stinky…but that doesn’t mean you can’t look great doing it. Workout wear has taken on a life of it’s own (and one of the few categories that hasn’t suffered because of the economy). There are boutiques devoted to nothing but fitness and exercise apparel and equipment. Yes, they might be more expensive than big box retailers, but in my opinion the merchandise is well worth it. Not only is the fabric better, but so is the fit and the design. And it’s so cute you can wear it even when you’re not working out. Luluemon is one of these boutiques and I have fallen in love. You get fabulous service from knowledgable staff, plus they offer in-store classes and run clubs, just to name a few extras. Here are my picks for summer. After all, working out is much easier if I’m happy with my outfit! One of the biggest issues I had with buying sports bras at the big box retailers is that they didn’t offer very good support. While my girls aren’t huge, they’re big enough (and old enough) to need support. This bra is great. It offers medium support and coverage, mainly due to the cross front and racerback. It also has removable cups which I love. This is perfect for low-impact like yoga. The support and coverage are low so if you have “girls” this may not be for you. The cross front always your skin to breathe and keeps the tatas separate. Also comes with removable cups. These crops are super soft and comfortable. The bound hem keeps the crops in place, while the waistband has a hidden pocket for keys and cards. Lightweight and ideal for hot yoga or running. The anti-stink mesh liner ensures you goodies stay hidden. It has a cinch-able drawcord so you can adjust the fit and the fold-over waist band hides the drawcord. They also have front hip pockets. This is great. The cut of the top is designed to fit over a full-coverage bra. It is made from Luxtreme and Silverescent fabrics which are moisture-wicking. And the cinch-able drawcord hem keeps the tank from riding up (I hate that). A dress designed for runners! The perforated panels are cute and allows skin to breathe while the four-way stretch lets you move in all directions. It also has reflective details so you are not invisible at night. And it’s cute enough to wear out and about too. This is the ideal bag for any girl that spends time at class. It can be worn as a messenger or tote and has tons of room. There’s a mesh pocket for sweaty clothes, front pockets to stow your shoes, and a back pocket that is roomy enough for a laptop. 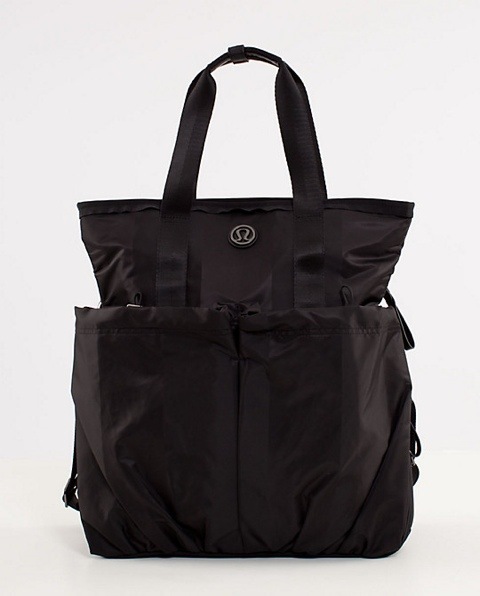 Drawcords keep everything in place and the side bottom zippers open so you can store your yoga mat. This tote is also a fabulous carry-on bag. As for my personal workout update, I am down 7 pounds! I have worked out every day for 25 days and have been at my calorie goal every day. I’m super excited because I am starting to see some real changes in my body, and that makes me happy inside and out! CONGRATS on your success!!! Hard work pays off. So proud of you Megan. Keep it up! Love the workout gear. Where is the store located? Thanks Nat! MOA, West End and Roseville.